November came with 4 games in the Scottish Premiership for the Rangers, half of which have already been played. They faced Partick Thistle and Hamilton at home and they will play against Dundee on November 24th as a visiting team and with Aberdeen on November 29th in Glasgow. After winning against the Hearts 1-3 on October 28th, the Rangers battled Partick on November 4th and scored 3 goals, thus securing a big victory. 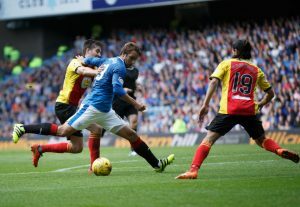 Partick didn’t manage to get the ball past the Rangers’ goalkeeper. Nearly 50k people watched the game on the Ibrox Stadium and cheered for McCrorie scoring the first goal of the match after half an hour of play. 9 minutes later, the crowd was ecstatic when Santos Cadeias brought the score to 2-0. The last goal of the game belonged to Windass who scored it only 2 minutes after half time. Rangers had 56% possession throughout the match and did twice as many shots compared to Partick. After their 2 back-to-back victories, the Rangers lost to Hamilton 0-2 on the Ibrox Stadium. Attendance was once again near full capacity and fans did their duty even though they came to be a bit disappointed in the end. After a half with no interesting events, other than the yellow cards received by Holt and Gogic, Templeton scored the first goal of the game in favour of Hamilton only 2 minutes after half time. Later on, after 81 minutes of play, Lyon secured the victory for Hamilton with a new goal. Possession was quite equally distributed between the 2 teams: 47% for the Rangers and 53% for Hamilton. In spite of having 17 shots, the Rangers managed to hit the target only 4 times without any results though. On the other hand, Hamilton had only 4 shots, 2 of which were on target and even resulted in goals. This means that Hamilton shot rarely but accurately, scoring every time the ball hit the target. Anyway, everyone is cheering for their upcoming games to move up toward the title. The Rangers currently hold the 4th position in the League table, with 24 points.